This was one of those projects that I will always remember as fun. 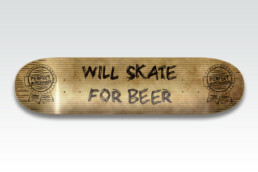 My client came to me with the idea of a “Will Skate for Beer” skateboard. Their idea was to just make a white deck with black writing. I suggested we take a it a step further, and make it look like the writing was on some old cardboard. They agreed. I tried taking pictures of cardboard, but found it wasn’t giving me quite look and control of I wanted. My solution was to create my own layered cardboard in Photoshop. By using my own file, it gave me the depth of color i was looking for, as well as the ability to create a “ripped” cardboard around the edges exactly where I wanted. 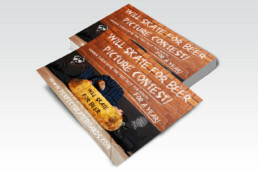 My client was so happy with the product that he used the look for a marketing campaign that included a photo shoot, social media, flyers, and more.